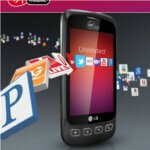 Now even though a few retail stores started to sell the LG Optimus V a couple days earlier than expected, Virgin Mobile officially announced the availability of its inexpensively priced Android powered smartphone. For those who held off from buying the handset thus far, today marks the official day of its availability through Virgin Mobile and RadioShack stores nationwide. In addition, you can even place your order through Virgin's web site for the acceptable price of $149.99 – which is something truly impressive considering it's not a contract phone. Essentially Virgin Mobile's version of the LG Optimus One, the Optimus V features a 3.2” touchscreen, 3.2-megapixel camera, and Android 2.2 Froyo. For being a relatively affordable smartphone, this Android powered smartphone packs a whole lot for the money – which makes for a solid buy in anyone's book. hello, i was wondering how easy it is to take a picture and then upload it to facebook off of this phone?